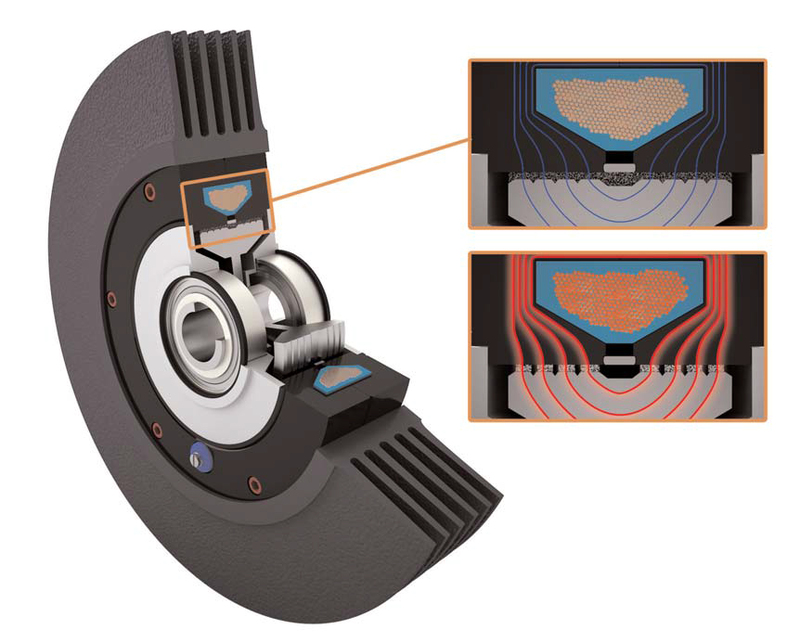 When designing a test bench, Particle brakes made by Merobel™ provide an excellent solution, because of their ability to generate a torque load that is precise, variable and easy to control – at a reasonable cost. Characterization, design validation, endurance, production, etc. 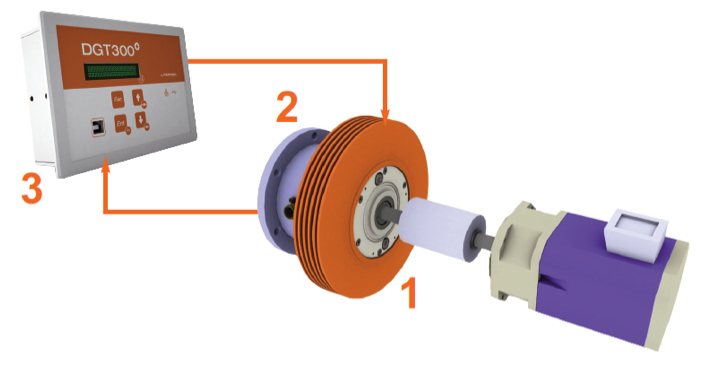 When designing a test bench, the Particle brake provides an excellent solution to simulate a variable load (resistance torque) on the motor shaft. 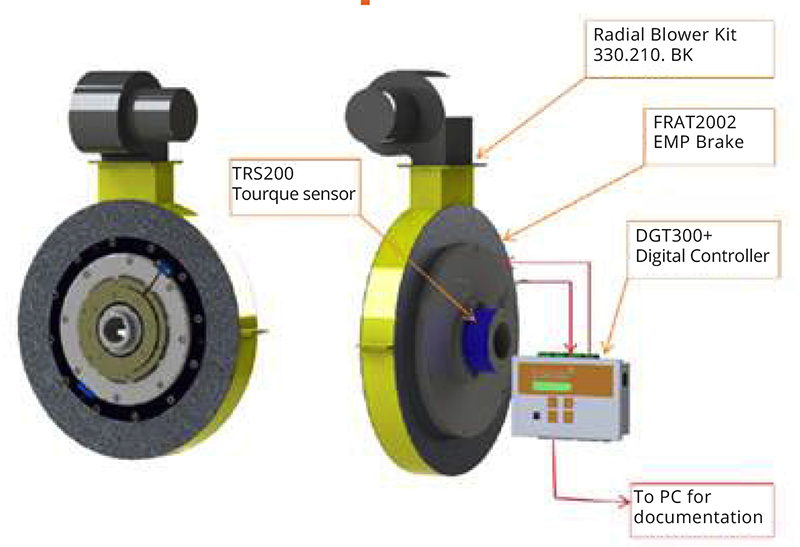 With reproducible and accurate torque fast response time, easy remote control and with low power consumption, Merobel Particle brakes offer an up-to-date and cost effective solution. The Particle brake powder reacts to the variation of a magnetic field generated by an electromagnetic coil. Varying the powder’s “viscosity” leads to the control of the torque transmission between the primary and the secondary rotors. When the secondary rotor is fixed to the equipment frame, the device is acting as a brake, otherwise it’s acting as a clutch. 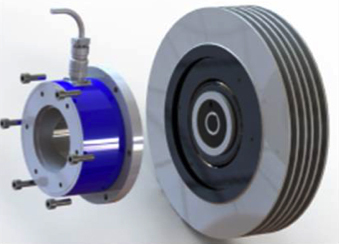 Merobel Particle brakes offer a compact design providing a large amount of torque relative to a small overall design. Little or no maintenance (by design), and very fast response times (10 to 50 ms). 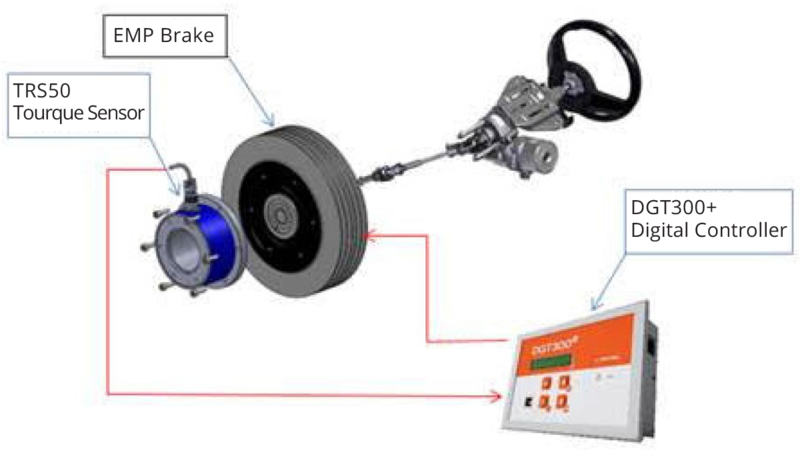 In conjunction with measurement and control systems (depending on the levels of precision required), Particle brakes can comprise the core element of test benches. 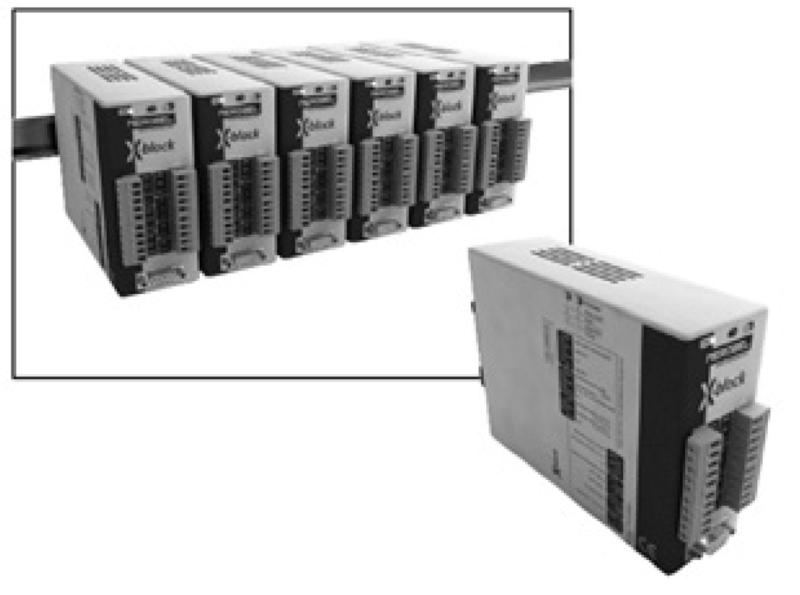 This technology is able to produce a reliable, reproducible torque load via a low power analog signal and can also be monitored and controlled via Modbus TCP/IP communication. 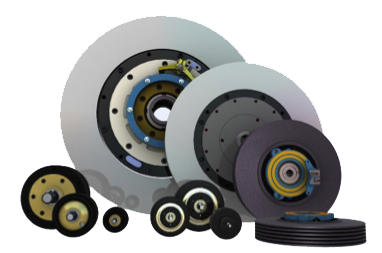 The very wide standard range of brakes enables a solution to be found for each requirement. Their design allows them to be linked together, if necessary, and for the addition of a torque sensor if needed. The first type are ones used during product development phase. The objective here is to prove the components design by simulating the operating conditions in a laboratory with as much similarity, as possible, to the conditions set out in the design specifications. The second type is an endurance test bench to prove the component design over time, while optimizing the final design during the manufacturing phase. The results obtained during the course of these different tests are crucial for the development of preventative maintenance programs. The third type are the test benches needed during the production phase. This is done to integrate test systems in the manufacturing lines. This is to ensure that the characteristics of the product manufactured meets the customer’s specifications prior to shipment. 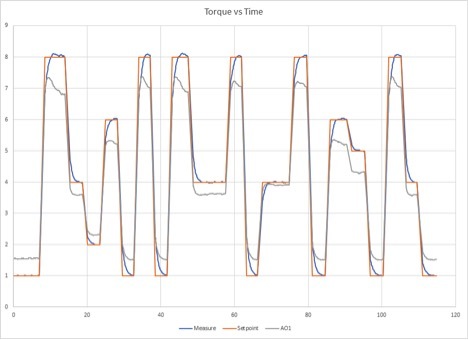 For production of actuators and components in mechanical drive systems, the goal of the test bench is to simulate the system load cycles, with repeated cycles of variable torque levels that reproduce the stresses during system service life. 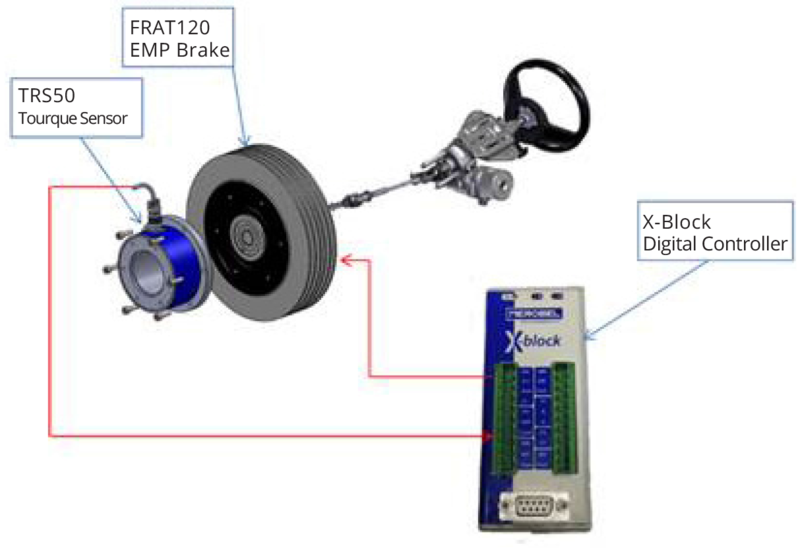 In the automotive field, for example, tests can be made to simulate shock loads on steering column systems and drive components, to replicate a vehicle going over a pothole, hitting a curb, or undergoing emergency braking. Moving beyond vehicle drive systems, we can also highlight the elements used to control steering (steering columns and power steering units, etc. ), and components such as starter motors, ventilation systems, and other electric motors (wind shield wipers, power windows, side view mirror adjustment, seat adjustment, etc.). This means that the test benches used to carry out the simulation of operations have to feature a very wide torque levels from 0.05 to 1,000 Nm, and speeds ranging from 10 to 1,500 rpm. Test bench designers, can also call on the expertise of the Andantex USA technical team to improve the cost effectiveness of their equipment. Our engineering department uses the latest simulation software needed to evaluate the overall heat dissipation for our customers applications. required to meet their application requirements, custom designs, support and solutions to enhance productivity. Get in touch with us to learn more about our comprehensive, low cost, viable solutions for test bench applications. Click here to print the full article.